As you celebrate America's Independence today, please take a moment to be thankful for the land we live in, the opportunities we have and the men and women who protect us. Remember how blessed we are to live in a country where democracy still rules. 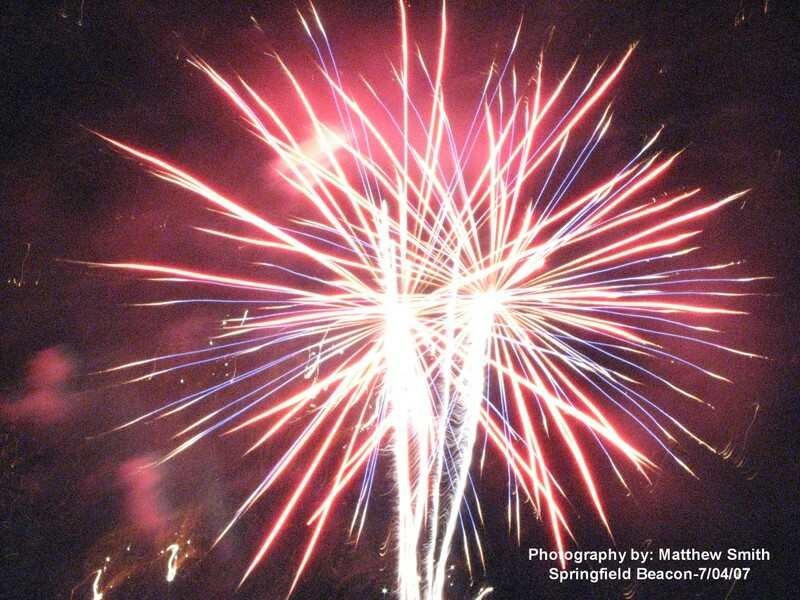 We will be in Springfield, Oregon providing the "Light of Liberty" Fireworks display tonight. As you celebrate this weekend, please be safe and sane. Love to all our family and friends. R & B. God Bless the USA! Been busy lately. We had the fireworks display to set up for the Oregon International Airshow. 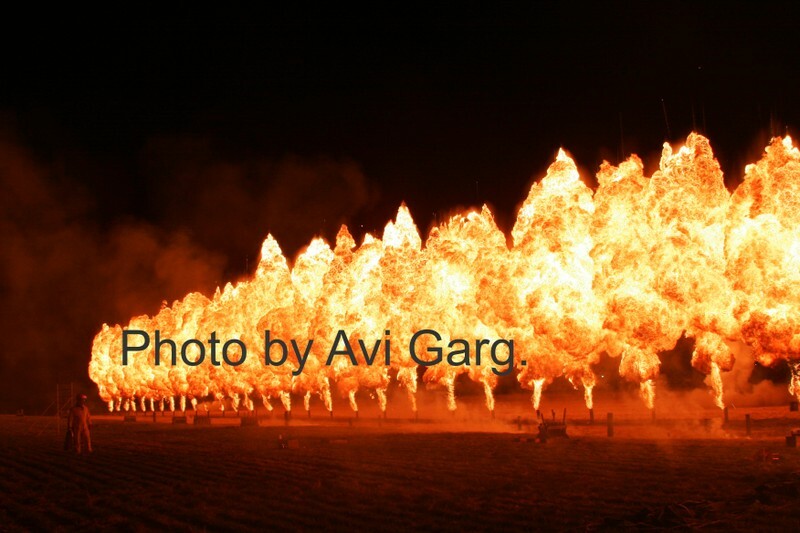 Along withthe display was Zubers signature 1000 ft wall of fire. I had to work at CCC most of the week but got off for setup on Friday. Then of course worked Saturday and Sunday helping with the wall. Bryant and I, along with many long time pyro friends set up what is called the "fronts" or ground display. These happen to be the lower level or mid level special effects, including several gas mines. 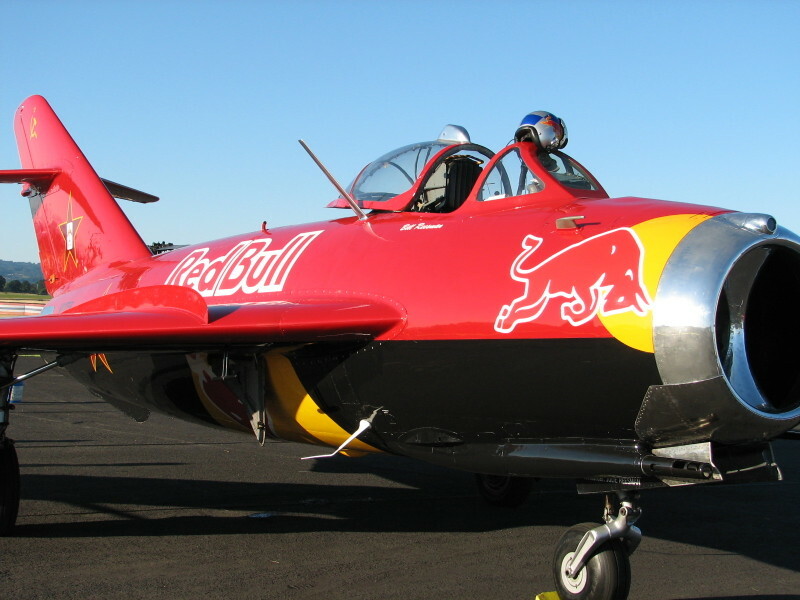 We worked with Bill Reesman and the Red Bull MiG 17 with our wall of fire. Bill and his wife Julie are nice people, easy to work with and appreciative. I love going to the morning pilot meetings. Getting to sit in on the meeting and listen with the Oregon National Guard F15 Pilots and all the stunt airshow pilots. I took the first pics of the Red Bull MiG while Bryant and I were delivering Bill's evening performance pyro product Friday. Sunday after our Wall with Bill Reesman, we (the crew) went over to the chalet tent set up for guests of Homeland Fireworks to watch the rest of the Blue Angels performance at the airshow with our family (all the grandkids) and a lot of friends. 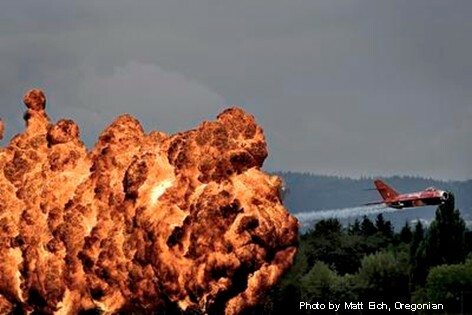 The shot of the MiG going into our wall of fire was shot by our daughter Bree and the last photo is by Matt Eich, Photographer to the Oregonian newspaper. It was a fun weekend. Great pyro, I drove around BZ's gator all weekend and working with all our wonderful friends! Can't beat it! Our show turned out really good. The crowd hooped and hollered at the finale! It was a great finale...building, building...wham bam! haha We had a great crew consisting of Kyle, Randa, Doug, Melissa, Wendall, Debbie, Heather, Joe, Luke and Hannah. We got started early and with the help of Wendall and Debbie's canopy's, beat the heat some. We did have a nice breeze most of the afternoon by the river that kept us a little cooler. We got all set up and had continuity by 5:00pm just waiting for the show to start. Debbie and I trained a new shooter, Luke. He did a great job on the show...kept up with the time cue's and paced with the music. We had two television crews out to the show site, but of course not sure what was broadcast on TV since we don't get to see ourselves. We had a reporter, Matthew Smith interview by phone from the Springfield Beacon. These are a couple of his shots of the show. I haven't been blogging lately like I should. I've been: (pick one) a. lazy; b. tired; c. crazy busy; d. brain dead or e. all of the before. If you chose E you would be correct. We have been so busy since our return from vacation. You all know that we do fireworks shows for the 4th. The big shows. I was no help to Bryant this year in getting shows ready for the fourth. He had to put music together for several shows, did choreography for Springfield and we did a pyro training in Umatilla 2 weekends ago. I on the other hand have been swamped at work. End of year budgets (finalizing the grants), payroll and getting ready for summer term. I was working my 9 hours a day just to keep up. I'd come home in the evening and just sit. Well some anyway. I did run some errands in there, cooked a couple dinners and cleaned the house during the week and last weekend when Bryant had to load trucks. I am moral support, but just can't handle the heavy physical work (lifting) like before. Got it all done though. The budgets came out fine, everyone got paid their final year end checks and summer term got started with no major incidents. The fireworks shows went very well and Bryant did a wonderful job on the music Cd's. We have a couple more shows coming up, including the Hillsboro Air show. This past weekend we had two fireworks shows to do. Saturday night was the Filbert Festival in Springfield, Oregon. Filbert Festival It's a decent size little show. A hand-light, which we use propane torches or fusee's to light with. We got there around 3:30pm and had the show set up within 45 minutes. Then the wait. haha. We had a lot of time to catch up, tell old stories. It was fun. The show itself went off with out a hitch. The crowd ooh'd and awe'd at the most appropriate moments. Showed their excitement and screams at the big booms and multi-shot shells. They cheered, hooped and hollered at the finale, which is always what we like to hear. That they liked the show. Sunday we had a little show (mostly class-C stuff) at the Morning Star Community Church here in Salem, Oregon. It is their church anniversary. In celebration they put on a little carnival of sorts with food booths, bouncy buildings for the kids and pony rides. They also have services in the afternoon with a concert to end the evening. A friend of ours and fellow pyro is a member of the church and always donates the fireworks for the show. We all donate our efforts and time to put the show on for the congregation. This year the show rocked! We had 45 little cakes, 178 festival shells and 30 big 3 inch shells. I'm telling you, those little multi-shot cakes really rocked. We also had a little multi-shot parachute cake, that when the shells burst they dropped little flags with parachutes. The kids loved them. It was a busy weekend with no errands run, no house cleaned or laundry done. We are trying this week to get caught up with chores after work. I'll let you know if we make it. haha. Got to get back to work to relax! I am just so thankful that I am able to do these shows. I get tired and maybe don't have the same energy as I did before, but I am getting better. Maybe slowly but surely! Oh yes, Thank you Jon for dinner. We appreciate your generosity. We found out Friday that Homeland Fireworks had a booth in the vendors area that we could set up with any information we wanted about the company. With such short notice we didn't have much, but grabbed a company banner, some photos we had with us and the laptop. We set up and displayed the pictures and the laptop was used to show clips from various shows we've done. It was fun. 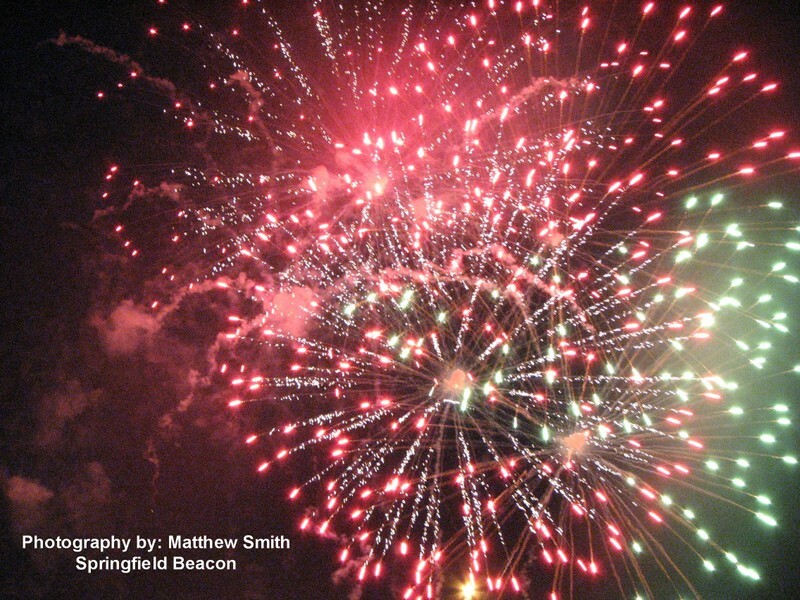 We answered lots of questions about fireworks, shows and the costs involved. Most people don't realize that they could afford a small fireworks display for a wedding, birthday party or family reunion! We then went over to the Chalet tent to see how our guests were doing and set for the upcoming display show. It was nice to see some of our sponsors and future sponsors enjoying the Airshow and refreshments. Our daughter took some pictures of the days events from the Chalet and our fireworks show. I'm sure you will recognize a few familiar faces in there! Bree is very talented when it comes to putting these videos together! Thank you Bree for letting me show my friends your video. Airshow/Fireworks Enjoy some of the show! 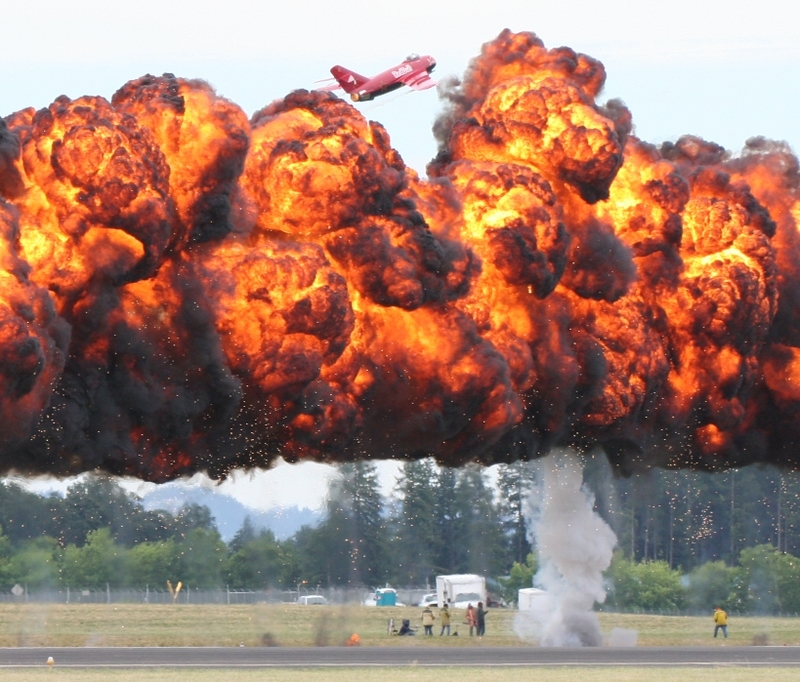 Tomorrow starts 3 days of setup and shows for the Oregon Airshow. The company we are now working with, Homeland Fireworks is an active sponsor and performer at the show this year. This will be our 4th or 5th year in a row doing the fireworks at the Airshow and the 2nd year for Homeland Fireworks. The crews were already out there today setting up some of the equipment for the front stations and cleaning (burning) the grass from some of the 1,000 ft of setup area. Better to burn it off ourselves now instead of the gas mines or fireworks later. I didn't go up today, I needed to get some things done at work and I had a dental appointment for a cleaning. I will be up there bright and early in the morning for a very long day of work. We have all day tomorrow and most of the day on Saturday to get the show in and setup. It is a great show and worth all the long hours. 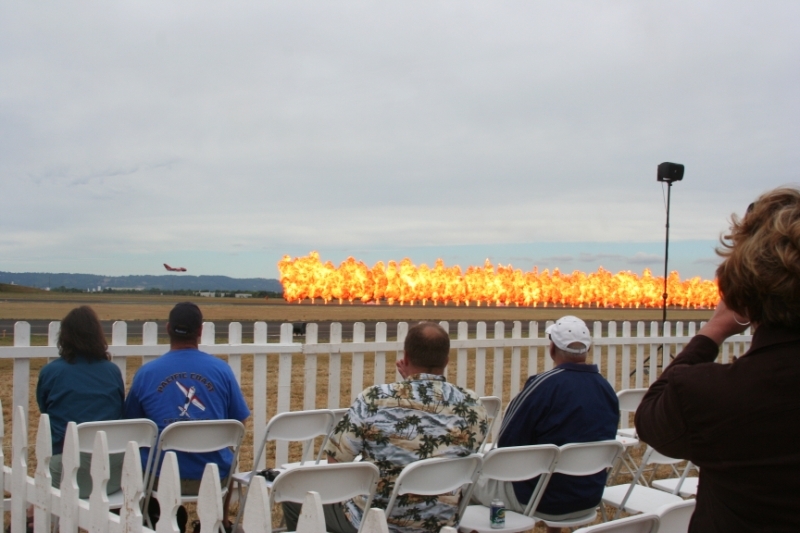 The crowds at the Airshow are very into and appreciative of fireworks and the awesome WALL OF FIRE that we do. The Fireworks display show with a Wall of Fire will be at dusk (around 9:45pm) Saturday night. Sunday we will have a showcased performance of the Wall of Fire. Come out to the airshow and FEEL THE HEAT!! Yes, from where you are as a spectator, you will feel the heat from the fire. And it is AWESOME!! !